Right – 340 ft (100 m). Ed Smith Stadium was formerly the spring home of the Chicago White Sox (1989–1997) and the Baltimore Orioles (1991). In 1998, it replaced Plant City Stadium as the spring training home of the Cincinnati Reds. The Reds remained at the facility through 2008. After Cincinnati's club moved its spring activities to Arizona, Ed Smith Stadium spent a year without major league Spring Training. The Orioles became the stadium's tenant and operator in 2010. Baltimore had trained in Sarasota before—at Twin Lakes Park in 1989 and 1990, as well as at Ed Smith in 1991—before moving to St. Petersburg and then Ft. Lauderdale for spring games. From 1989 to 2009, the stadium hosted a series of Minor League Baseball teams, the Single-A Sarasota White Sox, Sarasota Red Sox, and Sarasota Reds. 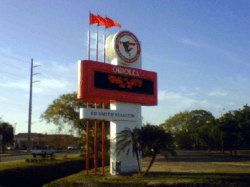 From 2004 until 2009, it housed the Gulf Coast League's Gulf Coast Reds. Ed Smith has also hosted high school and college baseball tournaments. On November 1, 2008, Barack Obama gave a speech to a crowd of 10,000 spectators as part of his 2008 presidential campaign. In 2008, a planned renovation fell through when a proposed bond issue from the city of Sarasota to partially fund the renovation was rejected by the voters. The Reds, whose lease with the city and the stadium expired after the season, announced that they intend to seek a new spring training home. They moved to Goodyear Ballpark, located in Arizona, in 2010. The Baltimore Orioles reached a tentative 30-year agreement to begin spring training at Ed Smith Stadium starting in 2010 which included renovations to the stadium and surrounding areas. The $31.2 million renovation was completed prior to the beginning of spring training in February 2011. Seats in the renovated stadium are refurbished seats from the Orioles' revolutionary home ballpark, Oriole Park at Camden Yards. Three air-conditioned suites added to the park are numbered Suites 66, 70, and 83, corresponding to the club's three World Series championships. A fabric sun shade system extends from the stadium's original roof to nearly double the number of seats in the shade. A series of photos produced by the Orioles shows the dramatic changes resulting from the renovation. Seating is available for 7,428 spectators, with standing room space taking the park's total capacity to 8,500. Two concourses include food and beverage stands, a cafe, and a 2,000-square-foot (190 m2) gift shop. 100 high-definition televisions are located throughout the stadium and a high-definition LED video board in the outfield measures 17 feet (5.2 m) high by 30 feet (9.1 m) across. ↑ Carol E. Lee (2007-11-07). "The Reds will seek a new place to play". Sarasota Herald-Tribune. Retrieved 2011-03-02. ↑ Don Muret (2011-02-28). "Orioles' spring training home becomes a swan". Sports Business Daily. Retrieved 2011-03-02. Wikimedia Commons has media related to Ed Smith Stadium.